The foundation of any well functioning body is good posture. The head weighs between 8-12 pounds. Carrying the head forward with slumped shoulders and/or rounded back adds to muscular stress which can be a source of pain. Chronic poor posture can lead to muscle and joint dysfunction which can lead to additional pain thus perpetuating a vicious cycle. Additionally repetitive tasks which require long periods of concentration such as computer usage and driving can further aggravate this condition. 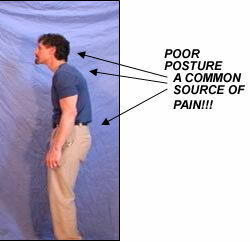 A quick way to alleviate this stress is to maintain good posture. This means while standing, sitting, lifting, etc. The chin is slightly tucked in with the head centered over the shoulders and shoulders over the pelvic (hips) girdle. There should be a slight curve in the lower back at all times such as with standing, lifting, bending and sitting. This gentle exercise will help warm the neck musculature while applying an easy stretch which in turn will reduce stress on these structures. Because this is a stretch you will hold this position 5 to 10 seconds and perform this stretch five times at each exercise session. 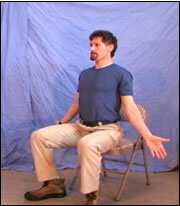 To perform this exercise stand or sit. Gently and slowly jut the head forward, then place your index and pointer fingers lightly on you chin to help direct the head and jaw back into a position of chin retraction. There should be a light stretching to the muscle deep in the neck and to the base of the skull. Sitting extended periods of time negatively effects the body. The act of statically maintaining a sitting position causes undue stress and irritation to the neck and shoulder musculature plus as fatigue sets in the rib cage often gets distorted due to slumping. This simple activity can be performed 3 to 4 times every twenty minutes when sitting extended periods of time. This exercise was created by Dr. Brugger, a Swiss neurologist. To perform this stretch sit at the edge of a sturdy chair or fit ball with the legs positioned widely apart and feet turned out. Next slightly tuck in the chin and let the arms hang down to your sides with thumbs pointing forward. Breath in from the abdomen and as you actively exhale turn the hand so the thumbs face as far backwards as comfortable. While performing this task slightly raise the chest to open up the rib cage. 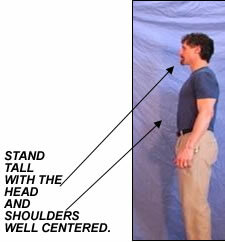 This activity can also be performed in a standing position. These stretches for the neck should be performed throughout the workday. When performed on a regular basis these stretches will improve flexibility and decrease stress on the neck and shoulder musculature. Each position should be performed gently. Hold each position at the end of your range of motion five to ten seconds. Do not perform these fast. Slow and controlled is your guiding mantra. If you feel any pain or dizziness during these activities be sure to stop immediately. NECK FLEXION - To perform this stretch sit up straight on a supportive surface. Gently tuck in the chin and look down until there is a stretch to the muscles located to the back of the neck. Hold this position 5 to 10 seconds. NECK EXTENSION - This stretch can be performed two ways. The first way is to sit up straight and look up until you feel a comfortable stretch. Hold 5 to 10 seconds. The second method is to gently tuck in the chin prior to looking up. While extending the head hold the tucked chin position. You will feel different muscles being stretched. Hold this stretch 5 to 10 seconds as well. Keep in mind stretching works best when performed on a regular basis and when not associated with other physical activities such as running, playing sports or weight training. 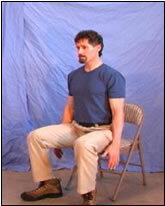 SIDE STRETCHES - To begin, sit on a supportive chair at work or fit ball if at home. Position your head to the end of motion to one side until you feel the muscles on the opposite side tighten. Hold for 5-10 seconds. Repeat to the opposite side. A variation of this exercise is to position the head to one side then turn your neck so you are looking down. This is a great way to stretch the trapezius musculature on the opposite side. Make sure to perform each stretch symmetrically before moving on to the next activity. Another variation is to position the head to the side and this time look up. This will stretch the deep neck muscles. ROTATIONAL STRETCHES - Slowly turn the head as far as you can without discomfort to the shoulder. Hold for 5-10 seconds. Then repeat by turning your head to the opposite direction. This will increase flexibility to the neck musculature.